Admiral Reinhard Scheer, commander of the German High Seas Fleet, built his plans for the operation that resulted in the Battle of Jutland around the use of zeppelins for long-range scouting. Previous fleet commanders had kept the airships close to the dreadnoughts for direct tactical support; Scheer now proposed to use their full capability for long-range strategic reconnaissance. Peter Strasser, commander of the Naval Airship Division, exulted that at least his beloved craft would be used for their true purpose. High winds had already limited airship activity for several weeks when on 23 May 1916 Scheer ordered Strasser to hold his squadron in readiness to support a fleet sortie against the English coast at Sutherland. Fifteen submarines were placed in the likely path of the British Grand Fleet if it tried to intercept the raiders after they bombarded the town. The airships would track the British advance and allow the Germans to locate any separated parts of the fleet and destroy them in detail. German pre-dreadnoughts in the North Sea, with a watcher overhead. For the next week the winds continued, and the airships could not be launched to aid the fleet. On 30 May, with the submarines nearing the end of their patrol endurance, Scheer decided to execute a modified form of his plan. The fleet would proceed directly northward, into the Skagerrak, the strait separating Denmark and Norway which connects the North and Baltic Seas. The Jutland peninsula would screen the fleet’s right flank. They would attack British patrols and merchant shipping in the area, hoping to provoke a response from the British battle cruiser force. Unknown to the Germans, the Grand Fleet also had plans involving the Skagerrak. Two squadrons of light cruisers would probe deep into Danish waters, with a squadron of dreadnoughts in the Skagerrak for support. The rest of the Grand Fleet, including the Battle Cruiser Fleet, would be to the northwest providing distant cover. It was exactly the disposition for which Scheer hoped, but poor German signals security threw away their chance for a great naval victory. The British deciphered radio signals indicating that the High Seas Fleet would soon proceed to sea, and the Grand Fleet actually left its bases before the Germans did. There would be no lone squadron of eight battleships waiting to be destroyed by the entire High Seas Fleet. Zeppelin L17 on landing approach at Tondern. The High Seas Fleet sortied at 0100 on 31 May 1916, led by Admiral Franz Hipper’s First Scouting Group. Strasser ordered five zeppelins to fan out across their path, with the first launch timed for 0300. Cross-winds kept the first airship from launching until early afternoon, and two of them, L11 and L17, could not get into the air at all. Quickly two others, L21 and L23, were ordered up in their place — stationed in a revolving shed at the Nordholz airship base, they were not as subject to the whims of the winds. When the German and British battlecruisers began trading heavy shells at 1530, the airships still had not left the sight of the German coast. Commander Otto von Schubert of L23 reported visibility of only half a mile, a low cloud ceiling and heavy winds. On receiving radio reports of the battle, Schubert’s ship and L14 tried to find the action but could not locate the heavy ships. L21 remained on station over the Dogger Bank in the central North Sea and L16 at her station just north of the Dutch coast. The fifth airship, L9, lost a propeller at 1628 and turned back to her base. When darkness fell Strasser brought his ships home and ordered a second set of five zeppelins into the air in their place. Scheer had radioed for urgent reconnaissance of the Horn Reefs area off the southern Danish coast — a message the British intercepted, but their analysts failed to note its significance. The zeppelins fanned out to the same patrol stations as their sisters had occupied the previous day; at 0310 Commander Martin Dietrich of L22 reported a tremendous flash of her port bow that marked the death of the battleship Pommern and her entire crew. 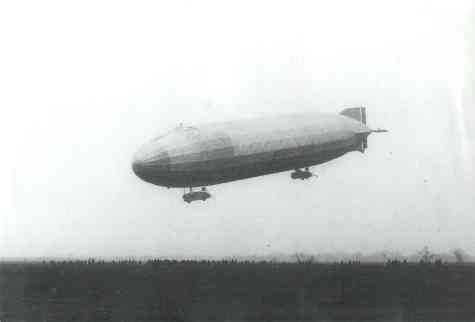 Zeppelin L24. Her false sighting reports helped confuse Scheer on the day after the battle. Koch reported that two of the enemy cruisers left the force to attack his ship, forcing him to veer away. But this was exactly the type of detailed report for which Scheer had hoped: the British had divided their forces (Jammer Bay lies off Denmark’s northern coast) and part of them could be attacked and destroyed in detail. But Koch apparently had hallucinated the entire incident: the ships did not exist. The suggestion may have come from the reports of Commander Viktor Sch_tze, who also reported spotting a dozen heavy ships at 0400. Unlike L24’s phantom warships, these actually existed — Sch_tze had found the Grand Fleet and, at 0440, spotted the Battle Cruiser Fleet as well. Sch_tze radioed that the ships he’d spotted appeared to have suffered no battle damage and must not have been engaged on the previous day. Collating this information with Koch’s false report, Scheer decided that this force must be the Third Battle Squadron from Harwich — one dreadnought (HMS Dreadnought herself) and seven pre-dreadnoughts of the King Edward VII class. If this force could be caught it would be quickly overwhelmed and a solid victory obtained over the British. But after toying with the idea of steaming west to intercept them — just as Admiral John Jellicoe in his flagship Iron Duke was sadly accepting that the zeppelin report had ended any chance of bringing the Germans to battle — Scheer decided on the safer option and ordered his fleet back to base at 0510. At 0726 he signaled Strasser that the zeppelins were no longer needed. 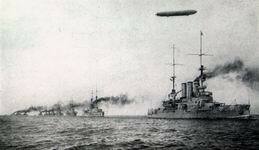 In Great War at Sea: Jutland, the German player has access to the same airship forces as did Scheer. The early-model airships available in May 1916 are not capable of attacking enemy warships. The airships are useful for scouting but very vulnerable to the weather, just like their historical counterparts. And just like Strasser and Scheer, the German player does not know how many of the flying cigars will actually make it into the air once so ordered. Click here to order Zeppelins - you need giant Zeppelin pieces!